Ap Intermediate 1st and 2nd Year Exam Hall Tickets 2019 Download IPE exam Center Locator App Intermadiate March-2018 and May-2018 Question Papers- previous papers AP Inter 1st Year and 2nd Year Hall Tickets 2019. Download AP Inter Hall Tickets @ jnanabhumi.ap.gov.in AP Inter Hall Tickets 2019 @ bieap.gov.in, Manabadi. AP Intermediate 1st year Hall Tickets March 2019 AP Inter Hall Tickets 2019 @ bieap.gov.in, Manabadi – AP Intermediate 1st year Hall Tickets March 2019. 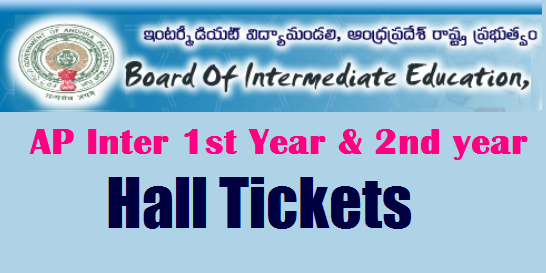 Board of Intermediate Education Andhra Pradesh BIEAP released AP Inter 1st Year hall tickets, 2nd Year Hall Tickets 2019 on its official website bie.ap.gov.in, manabadi.com, Schools9. BIEAP has released the hall tickets for the Jr. Inter Inter 1st regular examinations Feb-March 2019.School Authorities will issue their admit cards to them. AP Intermediate Hall Tickets 2018-19 are also Available On Online Candidates can check their Hall Ticket may Log on to official website bie.ap.gov.in to download. The Board of Intermediate Andhra Pradesh (BIEAP) is going to conduct the Intermediate examinations in feb and March months and they will release the admit cards for the first and second year general and vocational examinations. Candidates those who are studying in Inter 1st year and 2nd year can download their hall tickets from the BIEAP official website or JnanaBhumi website. will be able to download the admit card by logging on to the official website from the BIEAP official website or JnanaBhumi website. Aspirants can download the admit card for AP Intermediate with the help of registration number or application form number. Check complete information of AP Intermediate Hall Tickets 2019. ఇంటర్మీడియట్‌ హాల్‌ టికెట్లు శనివారం మధ్యాహ్నం 12గంటల నుంచి ‘జ్ఞానభూమి’ వెబ్‌సైట్‌లో అందుబాటులో ఉంటాయని ఇంటర్‌ విద్యా మండలి కార్యదర్శి ఉదయలక్ష్మి తెలిపారు. ఇంటర్‌ పరీక్షలు ఈనెల 27నుంచి ప్రారంభం కానున్న నేపథ్యంలో ఆమె శుక్రవారం అధికారులతో వీడియో కాన్ఫరెన్సు నిర్వహించారు. ఏమైనా సమస్యలు ఉంటే ఫోన్‌ నంబరు 0866-2974130, టోల్‌ప్రీ నంబరు 18002749868కు ఫోన్‌ చేయొచ్చని సూచించారు. ఉదయం 9గంటల నుంచి మధ్యాహ్నం 12 గంటల వరకు పరీక్షలు జరుగనున్నాయని తెలిపారు. విద్యార్థులు పరీక్షా కేంద్రాలను తెలుసుకోవడానికి ఇబ్బందిపడకుండా 'ఐపీఈ సెంటర్ లోకేటర్ యాప్'ను ఉపయోగించుకోవాలని వెల్లడించారు. Andhra Pradesh Intermediate 1st and 2nd Year Public Examinations February/March 2018 Hall Tickets download online from the bieap official website. Andhra Pradesh Board of Intermediate Education BIEAP conducted both 1st and 2nd year Intermediate Public Examination (IPE) from 27 February 2019 to18 March 2019. The First examination begin with 2nd Language paper for both Junior, Senior Intermediate Students and Last examination is Modern Language and Geography Papers for both first, second year General and Vocational Students. 2. Scroll down and click on “Board of Intermediate Education, Vijayawada, A.P. Hall tickets Download. 3. Enter your details and Select General, Vocational and enter your Roll/No registration and Get Your Hall Tickets. 1st Year students: Select General or Vocational Number and enter SSC Roll number. 5 .Take the print out & keep it a safe place for future use. "IPE Center Locator is designed for Intermediate level students, to know their exam centers with address and directions towards the college." By downloading the admit card, candidates can check their examination venue, subject-wise examination dates, timings of the examinations, etc. Students can also check the details of their roll number, name, scanned photograph, signature on the hall ticket. If any printing mistakes appear on AP Intermediate admit card 2019 students can report to the BIEAP authorities through the helpline numbers/email.